Doctor Who Online - News & Reviews - Rose Tyler Returns In Big Finish' Tenth Doctor Adventures - Volume 2! Rose Tyler Returns In Big Finish' Tenth Doctor Adventures - Volume 2! David Tennant and Billie Piper are reprising their roles of the Tenth Doctor and his companion Rose Tyler in three new Doctor Who audio dramas from Big Finish Productions in arrangement with BBC Worldwide. David Tennant’s Doctor, portrayed on screen from December 2005 until December 2009, returned in the 50th Anniversary special The Day Of The Doctor, with Matt Smith and Sir John Hurt in 2013, and on audio for Big Finish with Catherine Tate in 2016. Billie Piper portrayed the Doctor’s much-loved companion Rose in 2005 and 2006, returning for a number of stories in 2008. She also appeared as The Moment – which had taken Rose’s form – in The Day Of The Doctor. These new stories will be Billie’s eagerly-awaited debut for Big Finish. "Getting David and Billie back together was definitely on my bucket list – two wonderful actors who created an era of Doctor Who which is so fondly remembered and brought a different aspect of the relationship between the Doctor and his companion to the fore – love, both platonic and unrequited. It’s great to have the Tenth Doctor and Rose back again!" Doctor Who: The Tenth Doctor Adventures – Volume 2, to be released in November 2017, is comprised of three thrilling hour-long full-cast audio adventures. The set opens with Infamy Of The Zaross by John Dorney, in which an alien invasion of Earth isn’t quite what it appears to be – Camille Coduri guest stars as Jackie Tyler. In the second adventure, Sword Of The Chevalier by Guy Adams, the Doctor and Rose arrive in Slough in 1791 and encounter Chevalier D’Eon, an enigmatic ex-spy who has lived his life as a woman. Together they must fend off alien slavers, who have come to Earth to abduct valuable humans. Finally, in Cold Vengeance by Matt Fitton, the TARDIS arrives on Coldstar, a vast frozen food asteroid in deep space. But there is something sinister defrosting in the network of storage units… the Doctor’s old enemies the Ice Warriors! Nicholas Briggs plays Ice Lord Hasskor and Warrior Slaan. "It was such a special time for me, working with Billie and David on the TV show, and it is such an honour to revisit it with them on audio." 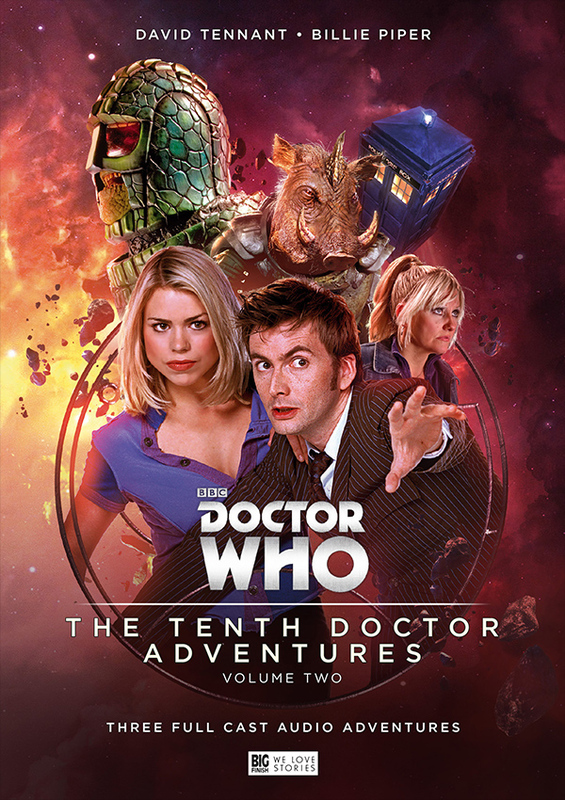 Doctor Who: The Tenth Doctor Adventures – Volume 2 is produced by David Richardson, script edited by Matt Fitton and John Dorney, and directed by Nicholas Briggs. Executive producers are Jason Haigh-Ellery and Nicholas Briggs. "We were thrilled by the response to the first volume. David Tennant and Catherine Tate were on fantastic form, and it’s so exciting to reunite David with Billie Piper, playing the Doctor and Rose together again after nine years! Their time in the series transformed Doctor Who into a prime-time and international hit, and we’ve worked very hard to live up to the incredible standards of Russell T Davies." Doctor Who: The Tenth Doctor Adventures Volume 2 (Limited Edition) is available now for pre-order on Download and CD. This five-disc collector's edition - limited to 5,000 copies - is available on CD in deluxe bookset packaging for a pre-release price of £35, with a download version for £25. The three stories - Infamy of the Zaross, Sword of the Chevalier and Cold Vengeance, can be bought individually for £8.99 on Download or £10.99 on Download. These are also bundled together for £22 and £25 respectively.